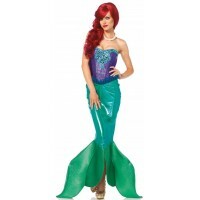 Dark mermaid costume for women includes figure flattering dark mermaid dress and the jeweled crown. Dark Water Siren Mermaid costume for adult women is a figure hugging and figure flattering dark mermaid costume that is sure to turn heads for Halloween or Cosplay. A Siren was a dark mermaid who would sing to the sailors on ships near their island homes bewitching the men causing them to ship wreck. The Dark Mermaid 2 piece adult mermaid costume set includes the black sequin bustier dress with light boning and shimmer foam fin with net overlay. It has pretty organza ruffled trim. This Dark Water Siren Mermaid costume comes with the jeweled crown. Item Number: LA-c85536 | Approximate Size (Inches): 10.00 wide x 2.00 deep x 14.00 high | Approximate Shipping Weight: 3.00 lbs. Stretch velvet opera length gloves in black add an elegant touch to any formal ware.One si..